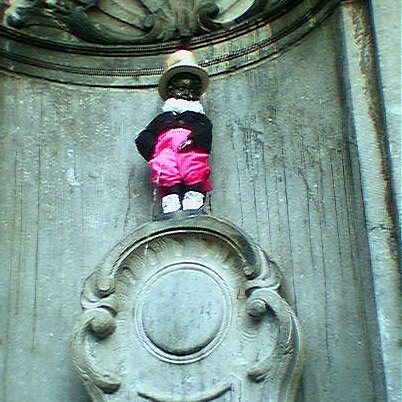 Finally...le voilà : Manneken Pis, dressed up and in action. This national symbol has been said to be the embodiment of the "esprit des bruxellois" (the spirit of the people of Brussels). I won't comment on what that might say about their esprit, that it is embodied by a tiny bronze peeing boy. 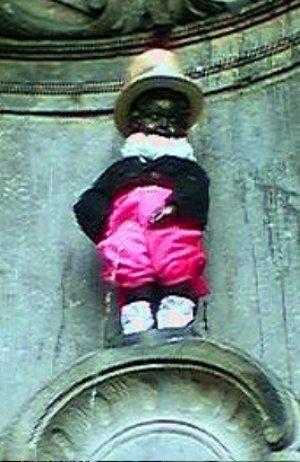 The present figure was designed in the XVII Century by Jerome Duquesnoy. The statue was stolen by the British in 1745 and by the French in 1777. In 1817 a French convict stole it, smashed it, and was consequently given a prison sentence - life with hard labor. Needless to say, he was re-molded and has since been collecting costumes. 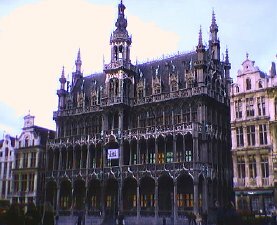 At present his wardrobe is sure to be comprised of well over 600 costumes (and growing) which are kept in the Musée de la Ville de Bruxelles which is located in the Maison du Roi at the Grand Place. 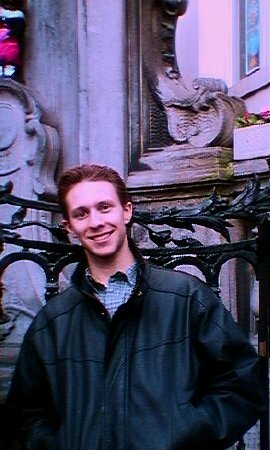 And then there was supposed to be this picture of me standing in front of the Manneken Pis; however, the photographer (no names mentioned, Mom) somehow managed to cut off most of the little peeing statue. No biggie...I think this is perhaps one of the best pictures of me since I've been here. And hey, look, no scarf this time.